In my last post, I had just finished shooting a "cute kids with horses" photo, and set about executing the original concept, a photo that highlighted the sponsors and planners of this charity event. 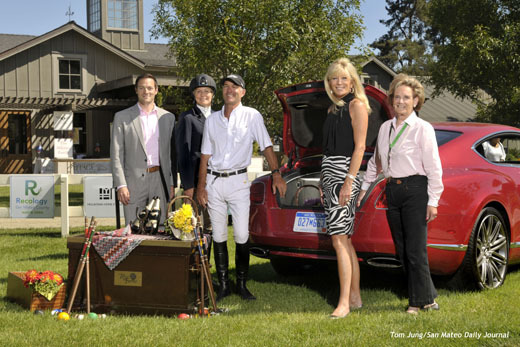 I caught up with the event's publicist, and together worked out a shot that included three co-chairs, an Olympic Equestrian, and a representative from Bentley Motors, a major event donor. It seemed logical to have a Bentley in the photo, so we chose to make it in the display area in front of the stables, which you can see in the background. Besides, convincing people to pose by a car would be easier that getting them next to a horse. We agreed that the shot would be made at exactly 3:45 and take no more than 15 minutes so that everybody would be available for the hors d'oeuvre and champagne party Bentley scheduled for 4:00 pm. More Planning: A shot like this doesn't just happen. Since the shot would be made in broad daylight, I would need to have as much light as I could muster. Speedlights weren't up to the task. While three SB-800s fired at full power might be bright enough, the ten-second recycle times would not be well received. With something of a sigh, I drove back to retrieve my "big guns", a pair of Norman 200B flashes. I normally use two in a cross-light arrangement for large groups, so I brought them both, along with two Eilenchrome Skyport radio triggers. Now I follow an old wedding photographer's maxim: Carry two of everything, just in case. So I packed two six-pound 200B battery packs, two Quantum X flash heads, and two Skyports packed in a backpack. To hold them aloft, I had a 12-foot light stand with double anchor points in case I had to mount both flash heads. With the flashes in a backpack, the light stand on my left shoulder, and my full camera kit on my right shoulder, I felt more like a pack-mule than a photographer and when I walked the 300 yards from my parking spot to the the per-determined location. After catching my breath, I mounted single Quantum head with the Skyport trigger on the end of the light stand and hoisted them about twelve feet off the ground. 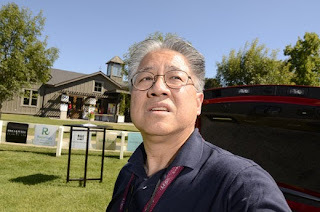 I made a quick self portrait by simply standing next to the car and pointing the camera at my face (Photo #1). I could now adjust the aperture to get the "look" I wanted. This shot was a little over-exposed, so I adjusted my aperture down by one-third of a stop. My final settings on my D7000 were 1/200, ISO 100, F 10. The lens was my 11-16 Tokina. The D7000 tends to be the "go to" body because the resolution is higher than my D300. Backup At The Ready: As a precaution, I took my second body, a Nikon D300, installed a 24-70mm lens, and applied the exact same exposure settings as the D7000. I did this so that if something goes wrong, I could simply pull the Skyport transmitter off the D7000 and install it on the D300 without worrying about the settings not matching. In Photo #2, the image is quite acceptable. Before I started shooting, I went down my standard pre-shoot checklist with my subjects. On closer examination, the stables in the background appear further away than they really are. This resulted in a lot of blue sky, which might not be desirable. Cropping wouldn't help the composition because it's the shooting distance, not the lens, that determines the spacial relationship between the foreground and the background. The focal length was already at 16mm, so I didn't have any more "lens" to zoom. Here's the shot, re-cropped (Photo #3). You can see how prominent the clock tower is. Border Shift: To change the foreground/background relationship, I switched out to the D300, transferred the Skyport transmitter, and quickly as far away from my subjects as was practical. I resumed shooting with the D300's lens set to 35mm, and got this shot (Photo #4). The final shot made the background a bit less "busy". Because the light itself hadn't moved (it was mounted on a lightstand), I didn't need to change my exposure settings when I retreated to my new shooting position. Umbrellas and softboxes could be blown over by a modest gust of wind. The flash output would have to be increased significantly, perhaps by a factor of four, or more. I would have needed a HUGE softbox or umbrella to have a noticeable improvement. So if you can't see an improvement, even when you're specifically looking for it, it doesn't matter. 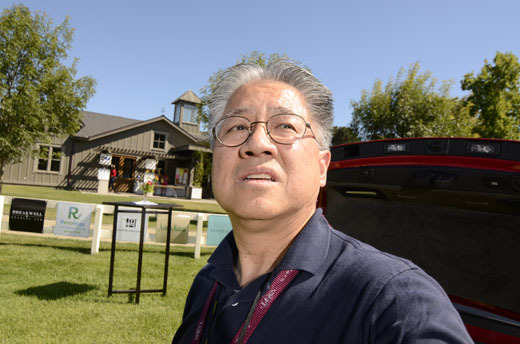 The designated Event Photographer for the Menlo Circus Club spoke with me briefly after the shot was made. She commented that she was having a great deal of difficulty producing usable images whenever there was sunlight involved. While she had a D700, a 24-70 Nikkor and an SB-900 with a Quantum Power Pack, I explained that there simply wasn't enough power in a single SB-900 to properly fill direct sunlight. That single Norman 200B has the same power as 3 SB-900's but deploying a Norman flash takes time, effort, and thorough exposure testing, since this was a totally manual proposition. But the final result was worth the effort. Incidentally, Photo #4 is the image my editor chose. Sorry kids.